Turkish Menemen Recipe is an amazingly tasty breakfast, lunch and dinner recipe. Summer tomatoes and green peppers combine with eggs in a pan to make this simple, quick and oh so yummy meal. Turkish omelette menemen is such a fantastic egg dish that you want to have it for all meals. It is a simple one-pan dish with eggs, tomatoes and green peppers. It is optional to add onion too. What makes this breakfast dish so special is the simplicity behind it. You always have the ingredients above, don’t you? Especially during summer. You can easily make a classic menemen recipe with these. I have a few additions to this classic recipe though. As I learnt from mom, I always add garlic along with the tomatoes and garnish it with some herbs right before serving. I love the freshness they give to the dish. Nobody can resist against dipping Turkish Simit into a pan of menemen. 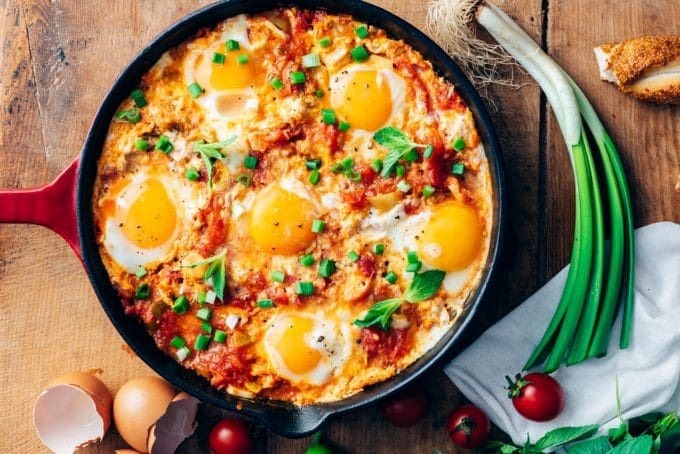 Although Turkish Menemen is traditionally considered as a breakfast food, people in Turkey make it whenever they need a quick lunch or dinner too. You might have heard about the world-famous Turkish breakfast, which consists of several appetizer-like foods. Yes we do eat cucumber and olives in the morning. Breakfast is a way of socializing in Turkish culture. We love to organize breakfast occasions at the weekend. So a healthy green smoothie or cereals can never be a breakfast food on its own for a Turkish family. Besides lots of tasty savory and sweet appetizers, we always have a version of egg. Maybe I can share a classic Turkish omelette recipe next time. There are three main foods to make this recipe: Eggs, tomatoes and peppers. Ingredients are simple, but quality is a must for a tasty menemen. Especially the tomatoes you use are very important, they need to be fragrant and flavorful enough, otherwise you will probably end up with a tasteless dish. Also, menemen is considered as spring or summer dish as tomatoes taste better then. If you are lucky to have preserved summer tomatoes though, you can make it whenever you crave for. For a classic Turkish menemen, you can either break the eggs right into the pan or beat the eggs first and then pour over the simmering tomato sauce. I love both versions, but I prefer leaving the eggs whole in the pan when we are crowded. It’s easier to serve it this way; one or two eggs for each person. If there are only two or three of us though, I just serve it in the pan. No need for plates! We LOVE to dip bread right into the same pan. Obviously, the best companion for this meal is a bowl of refreshing Yogurt and Cucumber Dip Cacik when it’s served as lunch or dinner. I can’t think of a better light and tasty meal for hot summer days. We have a different version of this amazing meal for winter days: Fried Eggs with Spinach. If you are a person who can combine any vegetable with eggs like me, give this recipe a try with the first spinach of the season. This always makes a super easy and healthy weeknight dinner. If you have a chance to make this Turkish Egg Dish Menemen Recipe, I’d love to hear your feedback. Please rate the recipe and leave a comment below! Classic one-pan Turkish egg dish with tomatoes and green peppers. Heat olive oil in a pan, preferably an iron cast. Add in chopped onion and green peppers, saute until tender. Add in tomatoes, garlic and green onions, let it simmer for 10-15 minutes stirring frequently until it thickens. Sprinkle salt over it. Using a spoon make rooms for each egg and break eggs into those hollows. Let it simmer uncovered until the eggs are slightly cooked for 8-10 minutes. Help egg whites cook well with a spoon. If you like the yolks hard, cook longer. Sprinkle ground black pepper over it. Garnish with chopped green onion and mint leaves. Serve in the pan. This post was originally published in 2016 and has been updated with additional information. Glad you love the recipe Supriya! It is still good the next day, but not as tasty as when it is fresh. Thank you for the recipe, will try tomorrow..
Hi Nor Azimah! It is one of the easiest recipes with simple ingredients but tastes soooo good! Hope you loved it. How nice you visited Istanbul! Our food is addictive, isn’t it? 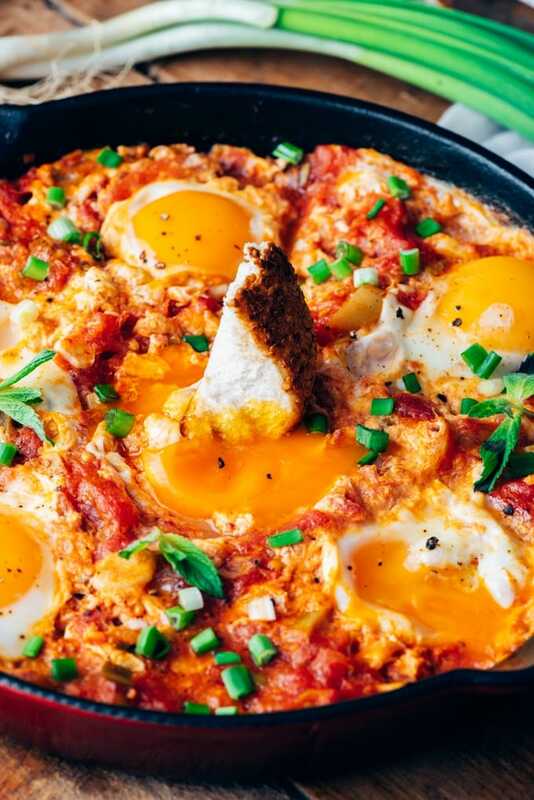 Hey, this dish looks so yummy and tasty I always loved egg recipes a lot of things you can try with the eggs, eggs always go with everything and make the dish special I will surely try this dish tonight and thanks for writing this wonderful article and sharing to us. Yummy! 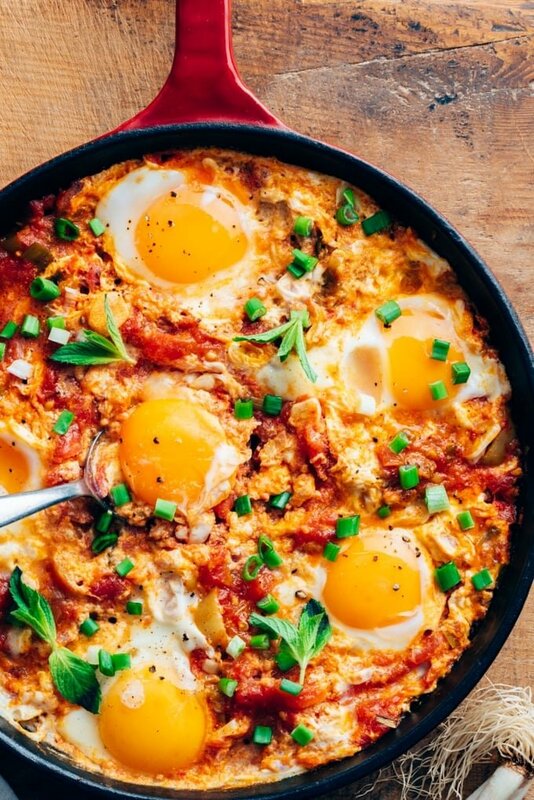 This turkish egg dish menemen looks so mouth-watering. Thanks for sharing such an awesome recipe. Looks delicious! I’m going to try this! What bread would you suggest be served with it? Thanks Kris! Any bread can go great with this dish, but I’d prefer one with a crunchy crust. Going to my to do list! Nice recipe, thanks! Hi Makos, thank you! Hope you have a chance to try it. Oh this dish looks incredible. Such a classic. Not to mention, the definition of Turkish “comfort food”. Thank you so much for the link love as well. Oh, this looks so good. 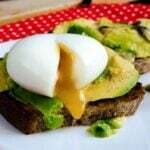 Love the photo of bread dipped in egg yolk! Pinned. Will definitely check out Turkish coffee. Thanks for sharing. Hi Mary! This is my all time favorite easy breakfast, lunch and dinner. Just don’t forget summer tomatoes work way better for this recipe. And I’m sure you love Turkish coffee if you are already a fan of coffee. cheers from Turkey!